**Need Make, Model & Deck Size. This can be added to the notes when checking out. Orders will not be processed without this information. Can I run a successful & professional mowing company without one? Will this fit my mower? We have a fitment for almost every commercial brand with decks of 48” or larger. You will put in your mower information at checkout. Deck must have a squared off opening (not round Hustler Raptor, residential decks, etc.) and Scag, Simplicity & Ferris brand require a curved attachment to close off the deck opening. Included at no cost with the kits for these mowers. It will work on some 36” mowers but does require some trimming of the blocking plate. Do I have to drill holes in my deck and does it void my warranty? Yes, you will need to drill 3 holes to mount it on all mower brands. NO, it does not void your warranty. Many dealerships install these on new units at the time of sell. No, we started running them on all our mowers in 2007 and after great results became a distributor in 2008. We don’t own a mower without one. Do I need to run mulching blades? No, but it does work great in the Spring & Fall when mowing through thick leaves. The ACS keeps the leaves under the deck giving them more time to be mulched. Will tall / wet grass clump up with the cover in the fully closed position? Yes, it can. It functions best in regular conditions and is made to control the clippings in areas where you need to minimize clippings and debris from reaching cars, buildings, windows, pools, landscape beds, traffic, etc. Also adding a safety value in areas where debris could be thrown recklessly. What is the difference between the Advanced Chute and the other ones I have seen? The Advanced Chute will last. Its built heavy duty with the commercial user in mind. With an all steel design it can take the abuse and still function as intended year after year. 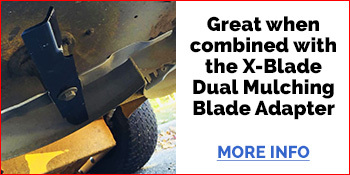 Before I purchased this, I was going to buy a mulching kit from the dealer. I ran across this and decided to order. I am so glad I did. This is a great way to mulch when you want, and side discharge when you want. I have never seen anything like it. It’s so easy to install and use. It is very well-made and will last many years! Now I don’t have to worry about buying special blades and a kit that clogs the underside of my mower. This is way better than buying a mulching kit from manufacturer. This is the best place to purchase this too! Kory and his team are the greatest people you will ever deal with! Great product!! Worth the money and works great! Saves time and money on raking leaves, all I can say is I should of bought it a long time ago! 5 star chute system! The shipping was fast. The system keeps me from bagging leaves in the fall!! It took about 45 minutes from start to mowing. I put this on my SCAG Tiger Cat and love it. The only reason for a 4 star instead of 5 is because the first one I got had a manufacturing defect.. I contacted Bad Boy and they had a new one shipped out that day. New one went together like it was supposed to.